Use the above link to a file of reources/practice problems. ONline examples at CoolMath for Lines you can use their examples and/or Lines Practice (scroll to bottom of the link) to find practice problems. Lots of students were attending e-Conference today with DECA. During class, we looked at writing equations for parallel & perpendicular lines. See links for examples. Also – HW! Retake your Linear Pre-Test! Truck A travels at a rate of 15 inches per second; At 5 seconds, it is at 91 inches. Truck B travels at a rate of 7 inches per second; At 5 seconds, it is at 20 inches. If the starting line is at 0 inches, determine where each truck started (ie in front of or behind the starting line and at what measurement). Be able to explain your reasoning. 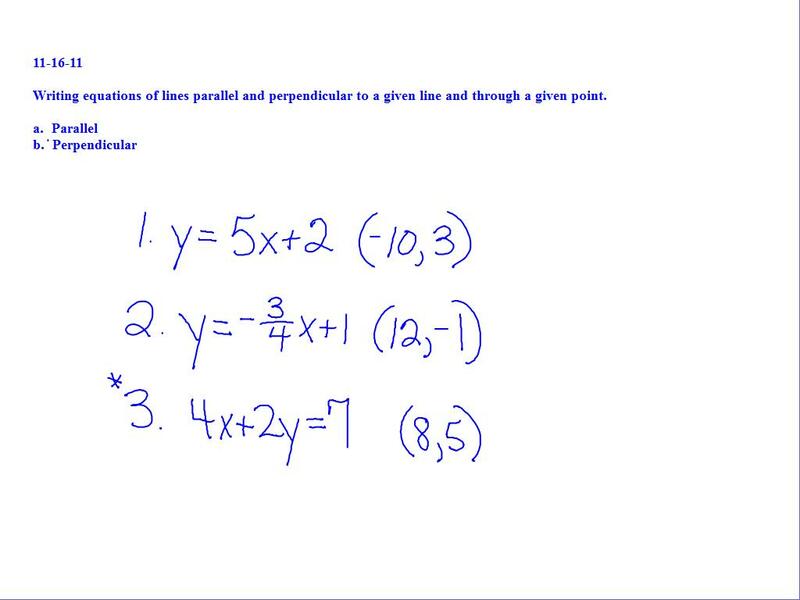 Looking ahead to Friday – writing equations of lines given slope & a point (refer back to geogebra activity). Use problems from pages 81 & 82 for problem sets. Create a line by plottting information given (either point and another point using slope, or two points). From the graph, determine the slope and y-intercept of your line and write an equation to model the line. Wednesday, we will algebraically write the equation to verify if your equations are correct. This will hopefully help you make connections between both the visual (graph) and algebraic (equation) models. Student choice of online resource – depending on area of need; linear functions – current unit; polynomials; systems of equations; Met with individual students to clear misconceptions/mistakes on solving equations; some students submitted for retake on assessment. Wednesday 11/2/11 Target Quiz T1 & T2 calculate slope; given slope-find two points. Standard Form – to model scenarios. Thursday 11/3/11 Intercepts / Students samples & discussion of how to interpret intercetps. Revisit Pre-Assessment – identifying targets with + or – on Organizer depending on student self/pre-assessment.